In an ongoing endeavor to be on the cutting edge of finding functional and space saving wine storage solutions, wine rack retailer Wine Rack Store takes it back to the drawing board to introduce a few new pieces in the form of wine furniture. Traditionally, bottles of wine are stored in traditional wine racks or wine cellars but Michael Kitson, owner and president of Wine Rack Store wanted something different for a storage offering that was both functional and appeasing to the eye. Kitson took to the drawing board and came up with a few original designs for wine storage solution that would function as both a everyday furniture and a wine display. 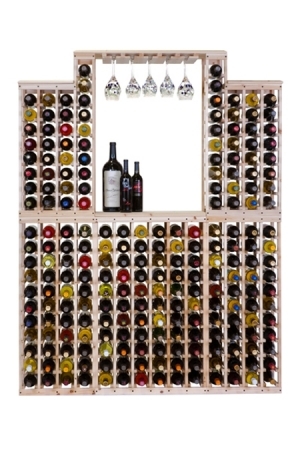 In the Wine Rack Store arsenal of wine furniture, customers can now find unique pieces like a wine coffee table, wine tasting table and various other wine glass holder tables and wine display combinations. “Our Wine Coffee Table is truly unique. We guarantee that you won’t find anything else like it on the market. This table is definitely a piece that’s perfect for a wine lover’s living room or family room,” said Kitson. 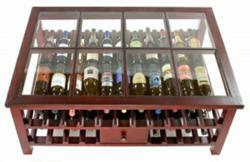 The coffee table holds up to 38 bottles of wine and has a convenient drawer, accessible from both sides of the table that can be used for remote and TV Guide storage. “Practical, functional, elegant, and sturdy, this wine rack coffee table is the envy of all my wine buddies. Even the owners of a winery I work for part time are impressed with this,” said James Hutchings, who purchased the coffee table for his home in Pennsylvania. The Wine Coffee Table as well as all the other wine furniture, are made with the same durable redwood as traditional Wine Rack Store wine racks and wine cellars and come in a choice of natural wood or one of 24 water-based stain color options to match existing décor.